Mitch Landrieu will be awarded the John F. Kennedy Profile of Courage in May for his work to alter the history of New Orleans. Landrieu removed the 133 year old, nationally recognized, landmark of a man that, ironically, JFK publicly respected. Kennedy not only respected General Lee but held him in high regard, mentioning the man in the same breath as great Americans George Washington and Thomas Jefferson. As obvious by the contrast in the two public servants’ speeches, Mitch isn’t fit to hold JFK’s worn socks. Remember, this is the same man who wrote a book while his city imploded. And we thought he was fiddling like Nero, come to find out while everyone was afraid of getting robbed, shot, concussed, or drowned, Mitch was planning his glory tour. A simple internet search shows that General Lee is listed on multiple websites as a famous soldier who was quartered at Jackson Barracks. He was in New Orleans before and after he served in the Mexican War. 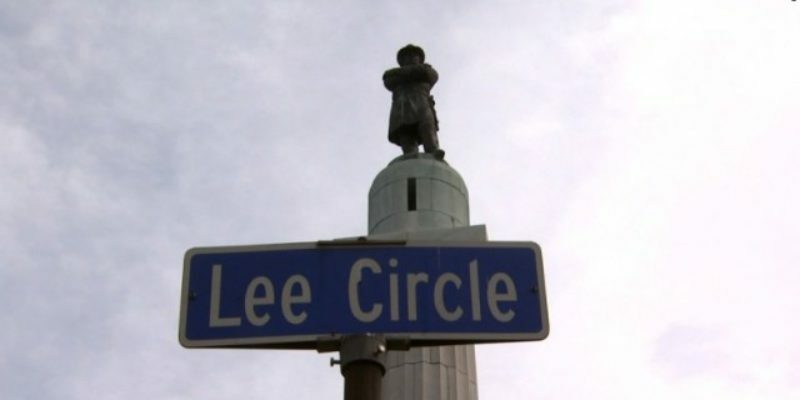 Aside from that Lee was in New Orleans on at least two other occasions just before war broke out. And this poor researcher wrote a book! It should also be noted that Mitch used political leverage disguised as democracy. The parties required in the Nuisance Ordinance to review the monuments were all appointed by Mitch Landrieu. c) In any hearing conducted pursuant to this section, the council shall solicit the recommendations of the city planning commission when required by the City Charter and comments and recommendations of the historic district landmarks commission, the Vieux Carré Commission (if applicable), other government or private historical offices or societies, the chief administrative officer, the city attorney, the superintendent of police, and the director of the department of property management. In any such hearing, the council shall also provide for the submission of comments and testimony by the public. Prior to any such hearing, the council shall request that public hearings be conducted by and recommendations obtained from the human relations commission or other appropriate agencies. The HDLC, Planning Commission, CAO, City Attorney, Police Superintendent, Property Management Director are all Mitch appointments. The man who placed these individuals in their respective jobs or boards initiated the process. The monument issue was never voted on by the people, only seven elected representatives voted on a highly contentious issue in a city of 390,000 people. And as noted by Council Members, Mitch went before them and told them he wanted to push this issue and tossed the racial hot potato to the black Council Members so that if they challenged it, they would appear to be turning on their own race. Mitch’s “process” was dictatorial, steamrolled, with him always in control of the outcome. These actions of a public official should not be commended, rewarded, or applauded. The John F. Kennedy Library will present a politically manipulative narcissist with a courage award for removing an historic statue of a man their namesake revered: Robert E. Lee. Mitch conducted the removals in secrecy, at night, with a domineering, militant police presence, rooftop snipers, using public funds and claiming as anonymous donations (lying to taxpayers! ), having masked NOFD do the removals, spent substantial taxpayer money spying on citizens, and he’s launched a national book and publicity tour to follow his actions. Mitch Landrieu should receive the Ted Kennedy self-serving cowardice award.